Welcome! This website highlights the results from my master’s thesis study conducted through the Ontario Institute for Studies in Education at the University of Toronto. The following tabs will highlight the background and context of the study, the methodology, key findings, discussion and recommendations. Throughout media channels, there have been concerns about a perceived job skills gap, which in turn have led to questions about the value of a university education. 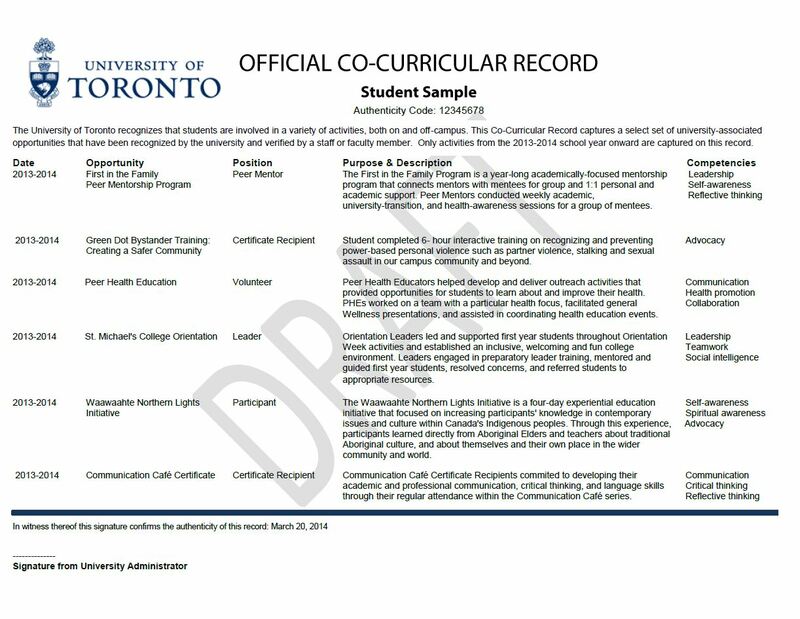 Canadian universities and colleges have developed the Co-Curricular Record (CCR) as a means to incentivize and recognize student engagement in co-curricular opportunities, which research has shown to positively impact student development, retention, and success (Astin, 1993; Chickering, 1969; Tinto, 1987). This study surveyed employers to explore current hiring practices, including the current value of candidate materials and hiring factors, desirable core skills, and the perceived value of the CCR. This thesis explores the potential use of the CCR in the hiring process, and argues that the CCR can act as a translation tool by elevating the value of co-curricular experiences in developing core skills. This thesis also discusses current challenges and provides a series of recommendations and next steps. Study citation: Elias, K. L. (2014). Employer perceptions of co-curricular engagement and the co-curricular record in the hiring process. (Order No. 1572371, University of Toronto (Canada)). ProQuest Dissertations and Theses, 143. Retrieved from http://search.proquest.com/docview/1650594021?accountid=14771. Copyright © 2019 Employer Perceptions of Co-Curricular Engagement & the Co-Curricular Record. Powered by WordPress. Theme: Spacious by ThemeGrill.